Our client is a specialist manufacturer of pigments. Consequently, managing dust and fine powders is a day-to-day requirement. Denca was initially in contact with our client’s parent company. As a result, when the issue arose, our client approached Denca to ask if we could take a look. First, we inspected the existing mixer installation and its operating environment. Our goal was not only to identify where the existing setup did not meet the current standards but, equally important, to show the areas where the installation was suitable. The Denca approach is always to deliver effective, imaginative solutions to our clients’ needs. We always aim to avoid doing work that is unnecessary or inappropriate. Our inspection was followed up with a comprehensive report of our findings. We also supplied our quotation to undertake the remedial work to bring the installation in line with current standards. Our quotation was accepted and we progressed to stage 2 of the project – design and installation of a new mixer control system. We also supported other contractors in their mechanical upgrade of motors on the mixer. *Interestingly, although upgrade was required for the lighting installation, the light fittings themselves met the latest ATEX standards. 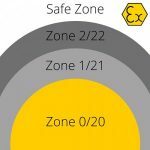 **All equipment within the ATEX ‘Zone’ had to be ATEX compliant. Consequently, by relocating some non-compliant equipment to an alternative (non-ATEX) zone, we were able to continue to use existing equipment rather than having to replace with components of a higher-specification. Although not a large project for Denca, this project was a great opportunity. We demonstrated that whether a project is small or large, we apply the same, creative process to delivering the best and most appropriate solution. Consequently, our client now has a fully-ATEX-compliant installation. In addition, Denca supplied appropriate documentation to ensure that the mixer can operate safely and effectively into the future. This entry was posted in Installation, Software, News, Documentation, Case Study, Design, ATEX. Bookmark the permalink.